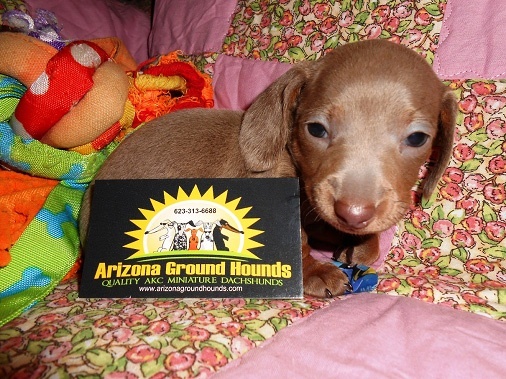 Arizona Ground Hounds offers a quick size reference for dachshunds. Dachshunds were originally bred as hunting dogs. Their long, wiry bodies made them very good at going down into the burrows of badgers and other prey and flushing them out. The Miniature Dachshund and Kaninchen were bred to specialize in hunting small prey like rabbits. In fact, the name "Kaninchen" is literally the German word for rabbit, and the breed is often referred to in English as the "Rabbit Dachshund." The World Canine Federation differentiates between the Miniature Dachshund and Kaninchen based on two measurements taken when the dogs are 15 months old: chest width and weight. According to the World Canine Federation standard, Miniature Dachshunds can weigh up to 4 kgs (about 8.8 lbs) and have a chest measurement of between 30 and 35 cm (11.8 and 13.8 inches). The male Kaninchen can weigh up to 3.5 kg (7.7 lbs) and the female 3 kg (6.6 lbs). Kaninchens must have a chest measurement of 30 cm (11.8 inches) or less. While the 83 countries of the World Canine Federation separate dachshunds into three classes (Standard, Miniature and Kaninchen), the Kaninchen is not recognized by the American Kennel Club or clubs in the United Kingdom. Clubs in these countries only recognize the larger Standard Dachshund, which it defines as dogs weighing between 16 and 32 lbs, and the Miniature Dachshund, which it defines as a Dachshund weighing less than 16 lbs.